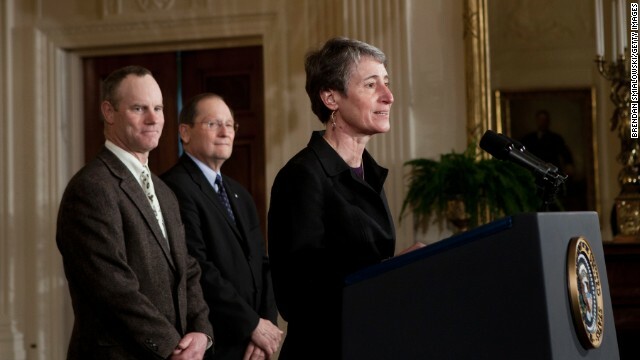 (CNN) - Sally Jewell, the CEO of an outdoor gear company and expert in energy and conservation issues, was named Wednesday as President Barack Obama's nominee to succeed Ken Salazar as secretary of the interior. She is the first non-male Obama has nominated to a secretary post in his second term. Obama has been criticized by some for selecting mostly white males for a variety of key posts, including the top spots in the departments of state, defense and treasury, although his cabinet makeup does not differ significantly from that of his predecessor President George W. Bush. Obama praised her work on renewable energy in her current job as president and CEO of the outdoor outfitting company REI. "She is an expert on energy and climate issues that are going to shape our future," he said. "She is committed to building a nation-to-nation with Indian country, she knows the link between conservation and good jobs, she knows that there's no contradiction between being good stewards of the land and our economic progress - the fact that those two go hand-in-hand." She has served eight years at the head of REI. Before that, she worked in finance and started her career as an engineer with the Mobil Oil Corporation. Jewell also participated in Obama's America's Great Outdoors Program, a project of the interior and agriculture departments to look at innovative land use models around the country. Obama said he suspects the "toughest part of the job will probably be sitting behind a desk." Salazar, a former senator from Colorado, announced in mid-January his plans to return home after four years in the cabinet. He held a key role in the Obama administration's response to the Gulf Coast oil explosion disaster in 2010, including implementing a six-month drilling moratorium which Republicans and officials in the region criticized as excessive. Obama said the country was stronger because of Salazar's accomplishments. The two former senators arrived in Washington together and were the only two Democrats new to the Senate in 2005. He recounted they moved into the same building - one which was largely populated by people in their 20s. "So we were the two geriatrics in this building," Obama said. Jewell's nomination now goes to the Senate for hearings and confirmations. Sally is the best for the job, it dosent matter if it a male or female. Its dosent matter what color the person is its who best for the job. Good choice obama. "expert in energy and conservation issues"
Well, that should be sufficient to light the Teatrolls' hair on fire. I thought the Obama adminsitration and the democrats didn't respect successful business people in the private sector – and that all they wanted from them were more taxes. Hypocrisy before our eyes. Want to infuriate a conservative? Become wealthy and give back to your community, your country and to your world. The proof is above. Why don't you call Pres. Obama by his "real name". Cant-Git-Right. Be careful how you toss around that hypocrisy charge. Your rant makes as much sense as chocolate tomato alfredo. You just criticized both sides of the issue. Dammed if you do and Dammed if you don't. "I thought the Obama adminsitration and the democrats didn't respect successful business people in the private sector – and that all they wanted from them were more taxes. Hypocrisy before our eyes." Hypocrisy indeed: You pretend Dems universallykloath successful people and that you want Dems to show respect for successful business people in the private sector, but when they do show that respect and appreciation and thereby prove you wrong on your sterotype, you criticize them for it and pretend they didn't do it.. This cover of "George Bush/Obama's Predecessor did it this way" or "George Bush/Obama's Predecessor did it that way" is getting so old. Obama, his admin hacks and the media hacks all sound like 5 year olds who got caught with thier hand in the cookie jar and use the excuse – Johnny did it so that makes it okay. Obama's whole campaign in 2008 was that he wasn't Bush and he would change the mean, illegal and useless ways of Bush – another fat lie by Obama, the first of many it turns out.